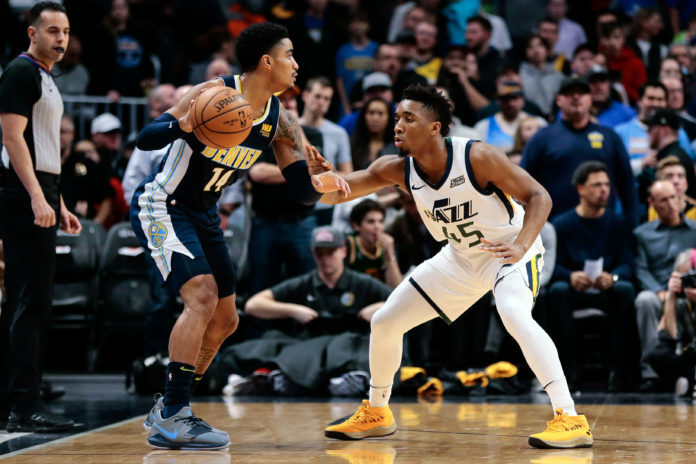 The 2017 NBA draft could haunt the Denver Nuggets for years to come and the poltergeist causing all kinds of animosity and anguish in the Mile High City is none other than Donovan Mitchell — the superstar rookie of the Utah Jazz who is setting the tone and leading the incredibly-underrated Jazz to a 1-1 series tie with the Houston Rockets in the second round of the Western Conference playoffs. Before we go any further, one thing needs to be understood. The Nuggets were never going to take a guard with the 13th pick in the 2017 NBA Draft. Back during the draft in 2016, Denver selected both Jamal Murray and Malik Beasley in the first round. The year before that, Emmanuel Mudiay was selected with the seventh overall pick. Lastly, back in 2014 Gary Harris was selected by Denver and ended up being one of the steals of the draft. Denver has selected four guards over three drafts, all in the first round, and bringing in a fifth would have made things difficult for all parties involved. I personally asked the Nuggets’ General Manager Arturas Karnisovas after the 2017 draft if a lead guard was a position that the Nuggets were looking to avoid selecting and that was answered with a swift confirmation. Again, Denver already had too many guards to develop and adding another would have been a disservice to the current guards on the roster, as well as Mitchell if he ended up in Denver. 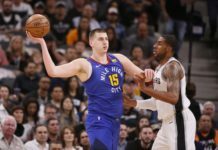 Now, Mitchell suddenly looks every bit like a superstar for a Jazz squad that was left out to dry with the loss of Gordon Hayward, who left for the Boston Celtics in free agency, and it is hard not to salivate at what a three-guard lineup of Murray, Harris, and Mitchell could have looked like in Denver alongside Nikola Jokic and Paul Millsap. The one wrinkle is that Mitchell likely does not get to see the court in Denver nearly as often as he has in Utah. The Jazz were starved of spacing and playmaking with the loss of Hayward, which forced Mitchell into a much bigger role. In Denver, Mitchell would have began training camp likely positioned behind Beasley on the depth chart with multiple obstacles standing between him and a starting spot. That is not to say that Mitchell would not have broken into the rotation. The one wild card when recklessly speculating about what would have happened if Mitchell was in a Nuggets’ uniform is Denver’s head coach Michael Malone. He values very particular skills — the skills that are most prominent in Mitchell’s game. Malone values fearlessness, pace, mental toughness, 100-percent effort, and defensive intensity. It is hard to imagine Mitchell not persuading Malone to continue moving him higher and higher in the rotation. Unfortunately, none of those thought experiments will ever happen in real life. Instead, Mitchell has exploded onto the scene and completed his first regular season in the NBA with averages of 20.5 points, 3.7 rebounds, 3.7 assists, and 1.5 steals in 33.4 minutes per game while being relied upon as the primary on-ball creator and scorer. 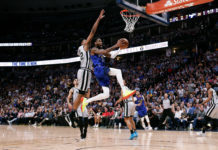 He is breaking nearly every preconceived notion about rookie lead guards as he continues to produce as a playmaker, a rebounder, a defender, and a volume scorer for a winning team and he is doing so against the toughest competition the league has to offer in the second round of the playoffs. 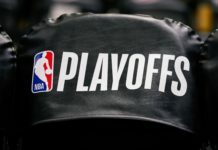 So far, throughout the playoffs, Mitchell is putting up obscene averages of 26.1 points, 6.4 rebounds, four assists, and 1.4 steals through his first eight games of postseason basketball. If the playoffs were to end today, Mitchell would be just the second rookie to ever average 26 points, six rebounds, four assists, and a steal per game in NBA history joining Chuck Pearson from back in the 1986-87 NBA season. Mitchell is becoming a two-way terror and a superstar lead guard in the Western Conference and he is just 21-years-old in his first NBA season. He is producing on the largest stages, while playing for a small-market team, and is showing the entire league that he is undoubtedly for real and ready to lead this Jazz team to new heights in the coming years. Nothing is for sure in the National Basketball Association, but betting on Mitchell continuing to grow and evolve into the best version of himself is as safe of a bet as there is. Because of that, Mitchell will continue to haunt the Nuggets for likely a decade, or longer, and no amount of sage, salt, or any other metaphysical cleansing device can remove the apparition of what could have been.